On Saturday April 28th, 2018 beginning at 9 am at the Sunday Creek Rifle Range. 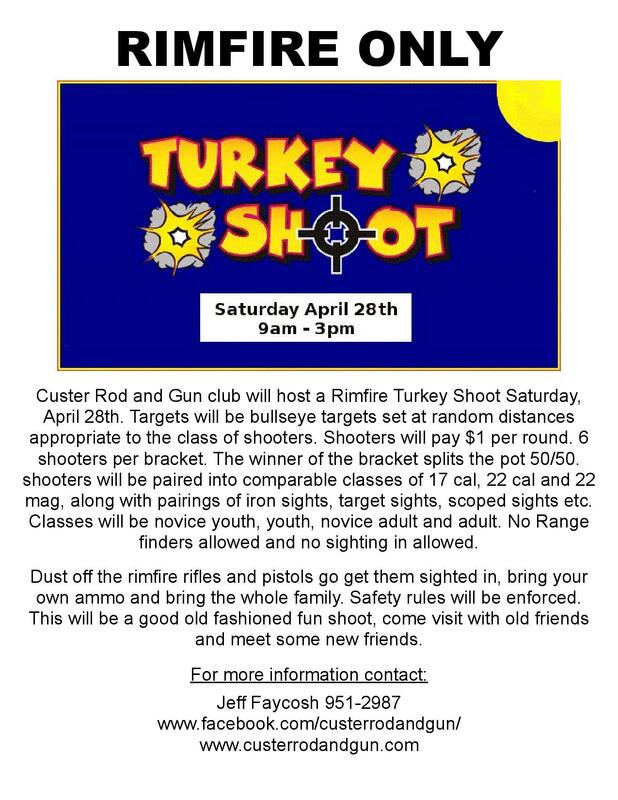 Custer Rod and Gun club will host a rimfire only turkey shoot. Targets will be bullseye targets set at random distances appropriate to the class of shooters. Shooters will pay $1 per round. 6 shooters per bracket. The winner of the bracket splits the pot 50/50. shooters will be paired into comparable classes of 17 cal, 22 cal and 22 mag, along with pairings of iron sights, target sights, scoped sights etc. Classes will be novice youth, youth, novice adult and adult. No Range finders allowed and no sighting in allowed. Dust off the rimfire rifles and pistols go get them sighted in, bring your own ammo and bring the whole family. Safety rules will be enforced. This will be a good old fashioned fun shoot, come visit with old friends and meet some new friends. This entry was posted in General News, Other Events, Upcoming Events on March 22, 2018 by Jeff Faycosh. 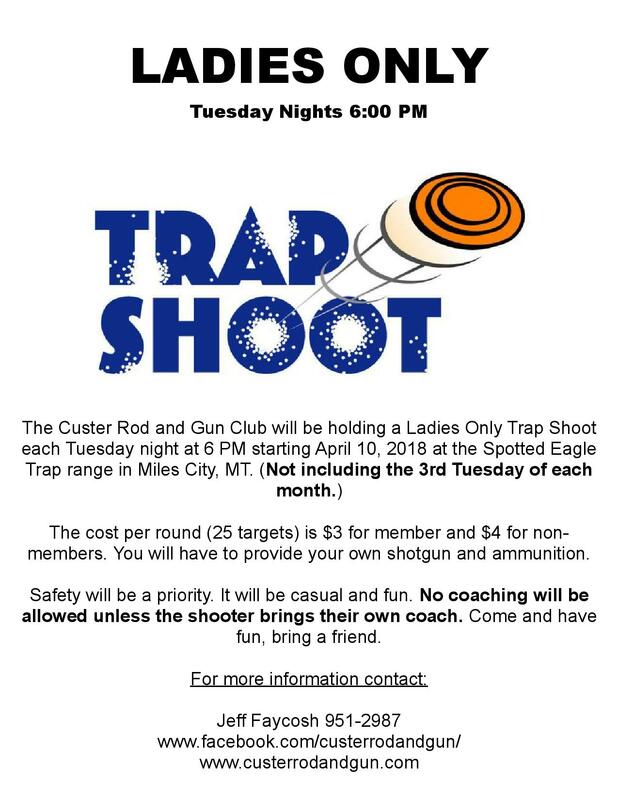 On March 20, 2018 at the Custer Rod and Gun Club board meeting it was approved to have a Ladies Only Trap Shoot each Tuesday night at 6 PM starting April 10, 2018 at the Spotted Eagle Trap range. The cost per round (25 targets) is $3 for member and $4 for non-members. You will have to provide your own shotgun and ammunition. Safety will be a priority. It will be casual and fun. No coaching will be allowed unless the shooter brings their own coach. Come and have fun, bring a friend. These shoots will take place every Tuesday except the third Tuesday of each month (board of directors meeting night). If you have questions contact Jeff Faycosh 951-2987. This entry was posted in General News, Other Events, Shotgun, Upcoming Events on March 22, 2018 by Jeff Faycosh. This entry was posted in Meeting Minutes, Upcoming Events on March 14, 2018 by Custer Rod and Gun Club. Though only members of Board of Directors can introduce or vote on a motion at the monthly Board meetings, all club members are welcomed and encouraged to attend meetings. Any member with concerns or comments will be provided opportunity to speak at these meetings. The Board always seeks the opinion of and direction from club members. The Annual Club Meeting in January is open to motions from any club members present. This entry was posted in General News, Meeting Minutes, Upcoming Events on February 3, 2018 by Custer Rod and Gun Club. – Calab Bollman of FWP requests use of Spotted Eagle archery range for Hunter Safety Field Days Sundays Feb. 25th, and April 29th. This entry was posted in Meeting Minutes, Upcoming Events on January 11, 2018 by Custer Rod and Gun Club. Memberships MUST be renewed between Dec. 1 and Feb. 15th. No renewals will be sold outside of those dates. If you were don’t renew your membership before Feb. 15th, 2018, you will not be able to purchase a renewal or new membership until 2019. This entry was posted in General News, Upcoming Events on December 22, 2017 by Custer Rod and Gun Club. Your presence is requested at the annual CR&GC membership meeting and banquet. This year’s meeting will be held at 6:00 pm on January 20th, 2017 at the Town and Country Club (S. 4th St. and Eagle Ave) in Miles City. In traditional CR&GC style, the club will provide roast beef, potatoes, and dinner rolls. Attendees A thru M are asked to bring main or side dish and N thru Z a salad or desert. There will be door prizes and raffle items including a Glock 19, a SIG P320, Savage .17 HMR package w/ Scope and Ruger American 6.5 Creedmore, also MUCH MUCH MORE! All present with a 2018 paid membership will be entered in the door prize raffle, just for attending. Eligible members must be present to win. All prize and raffle availability is terminated at the conclusion of the annual club meeting. Membership renewals will be sold at the door, but if you renew online before the meeting please bring your membership card with you, as the attached stub is your entry for the door prize raffle, and the membership card is required to vote. More prizes are accumulating as we speak and may include additional firearms. Please keep in mind that the meeting space, servers, and food provided by the club is paid for by the raffles held during the banquet. If you have any items you would be willing to donate to the raffles, please contact email at email@custerrodandgun.com to arrange for them to be included in the raffles, and picked up before the meeting if necessary. This entry was posted in Meeting Minutes, Upcoming Events on December 18, 2017 by Custer Rod and Gun Club. This entry was posted in Meeting Minutes, Upcoming Events on September 18, 2017 by Custer Rod and Gun Club. Saturday September 16th Postponed until September 23 due to rain. $15 Entry fee per division. $5 Range fee for the match. 4 stages of Action Pistol followed by 4 different Side games/pots. After the Action Pistol stages are shot the scores and times will be calculated for determination of Jackpot winners. During this time we will be shooting the side matches. Bring extra money and ammunition! Semi-Auto handgun with post and notch sights, no ported barrels, no large flared magazine wells (smaller flared magwells practical for concealed carry will be accepted), no lightened or weighted slides. In other words, a nearly off the shelf production gun that would be typical for a concealed carry weapon. All semi-autos or revolvers that have features prohibited in the Stock Pistol or Stock Revolver divisions. Same requirements as Stock Pistol, but limited to ladies only. 70 minimum round count if you don’t have any misses, makeup shots, or re-shoots due to malfunctions. Plus you’ll need ammo for side games. Shooters are recommended to bring at least 200 rounds. Each side match will cost $1.00 per attempt and 50% of all money collected for each side match will be paid to the best time for each side game. This entry was posted in Action Pistol, Upcoming Events on September 2, 2017 by Custer Rod and Gun Club. This entry was posted in Action Pistol, Upcoming Events on August 29, 2017 by Custer Rod and Gun Club. This entry was posted in Action Pistol, Upcoming Events on August 22, 2017 by Custer Rod and Gun Club. This entry was posted in Action Pistol, Upcoming Events on August 15, 2017 by Custer Rod and Gun Club. 8) Nomination and election of officers and board of directors. This entry was posted in Meeting Minutes, Upcoming Events on August 12, 2017 by Custer Rod and Gun Club. This entry was posted in Action Pistol, Upcoming Events on August 8, 2017 by Custer Rod and Gun Club. This entry was posted in Action Pistol, Upcoming Events on August 3, 2017 by Custer Rod and Gun Club. This entry was posted in Action Pistol, Upcoming Events on July 25, 2017 by Custer Rod and Gun Club. This entry was posted in Action Pistol, Upcoming Events on July 18, 2017 by Custer Rod and Gun Club. 5) Reports of Boards and Standing/Special Committees. This entry was posted in Meeting Minutes, Upcoming Events on July 9, 2017 by Custer Rod and Gun Club.